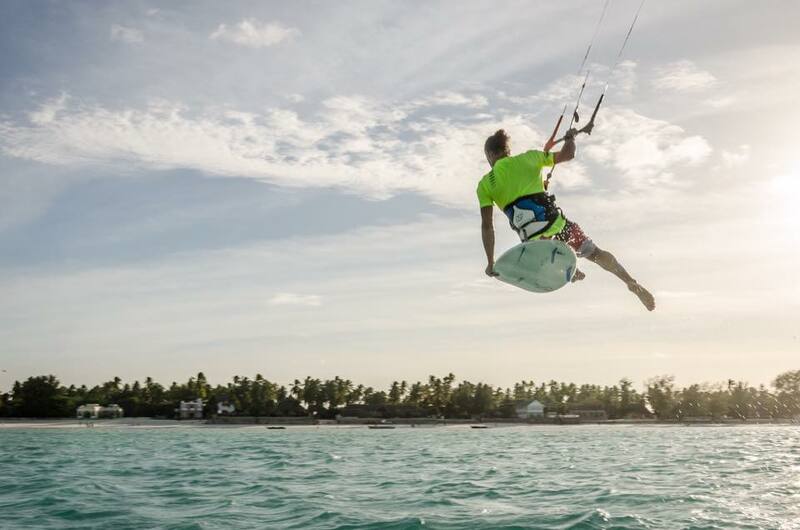 It’s on the South-East Coast of Zanzibar that you will find the best conditions for kiting! Super flat at low tide, good for freestyle ; small waves to play strapless at high tide, and the reef at less than 2 km from the beach. The spot is suitable for all levels and disciplines! Perfect for beginners, we teach mostly at low tide or mid tide to give them the best conditions to learn! A very steady wind, will allow you to improve your piloting skills and be focus on your riding! Our spot is delightfully open and free of water traffic. For waves lovers, the reef boasting some clean, long interval waves up to 2 meters. We dare you to give it a go! We have 2 wind seasons in Zanzibar: from mid-December to the beginning of March and from mid-June to the end of September. The wind is blowing from 10 to 20 knots we usually ride with kite sizes between 9m and 15m. We teach & kite according to the wind & tide conditions. Tides can change so much that can offers you such a different scenery ! You will never be bored ! Kiting is like a family, and everyone from our team will be always ready to help you, give you advices and make you have a perfect time with us! After work as instructors and managers for a while, it’s now time for them to give birth to their own baby ! And not anywhere !! In Zanzibar, one of the best spots of the world ! The school is located in NUR BEACH RESORT Hotel, few meters far from the beach Zanzibar Prokite is the touch of fun and action added to the cool and relax ambiance from NUR. What else better than a refreshment after your session ? It is our goal to provide a comfortable setting and to make you feel welcomed and appreciated. These are the conditions at Jambiani Beach can give you an experience of a lifetime while you cruise the soft waves of the Indian Ocean. Jambiani charming village of fishermen, is famous renowned for the seaweed culture and his football team of course! For sure the occasion to try one! Fishermen, women and kiters, everyone, find his place in the lagoon in compliance!